I find it hard to compromise when I travel; I often find myself forgoing the indulgent hotels in favor of the gritty hostel, campsite, or staying with locals. It’s not about saving money; it’s about getting to know somewhere (It’s also about saving money). Sometimes that can be difficult curled up in your duck feather duvet, sipping on tiny bottles of champagne from the mini bar. But then again, I do miss those luxuries from time to time and what tired traveler can resist the comforts of a modern hotel? And then you find the exceptions, those places that refuse to compromise. 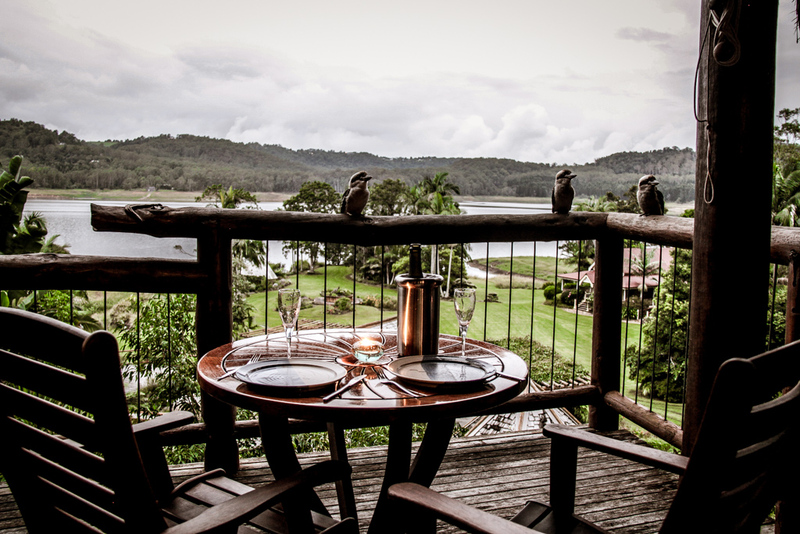 Secrets on The Lake is a perfect mixture of adventure and decadence; and nestled in the rain-forests of South East Queensland, Australia it offers the best of both worlds. 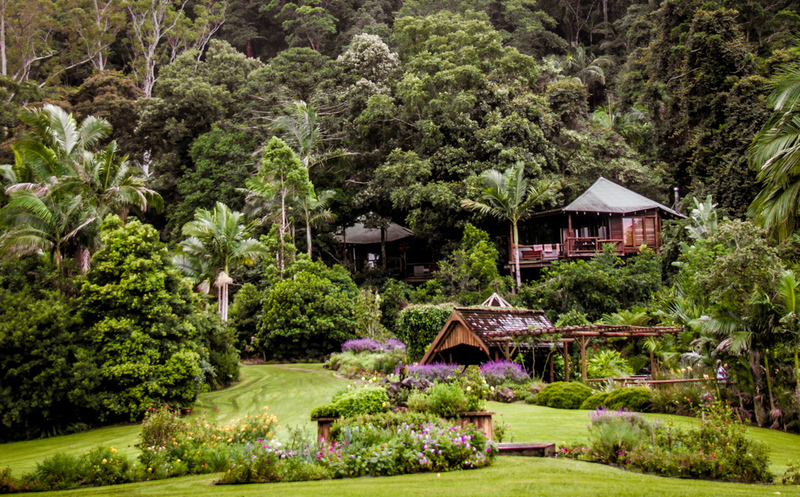 Ten tree houses sit atop the canopies of the Kondalilla National Park rainforest on the shoreline of Lake Baron in what can only be described as a real-life fairy tale. 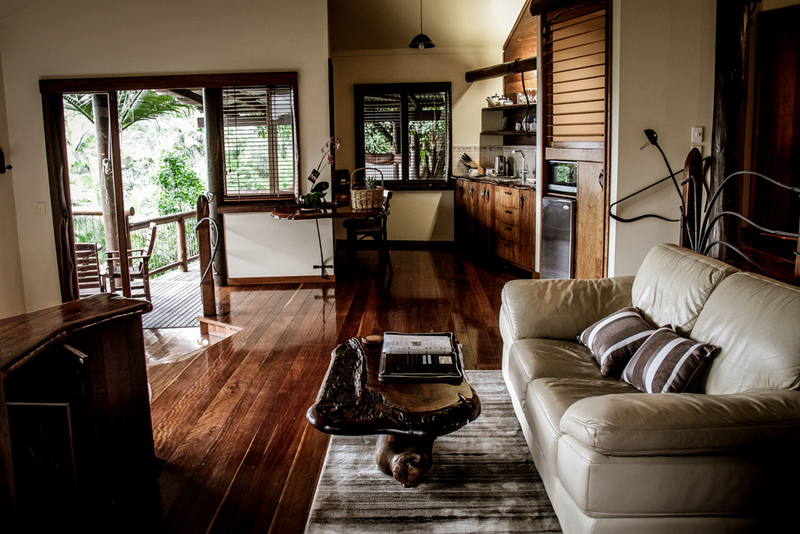 Each tree house has been individually decorated by a local artist according to a theme; And the hand carved beds, kitchens and artworks give each cabin its own unique charm. 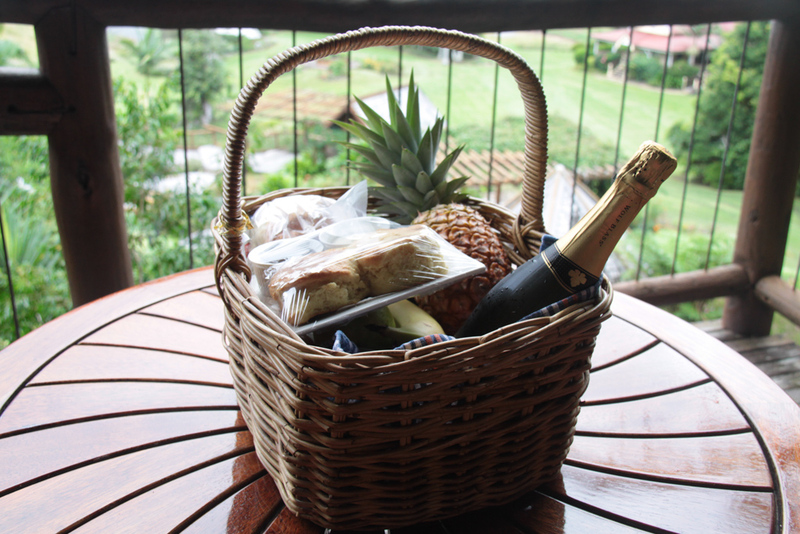 I arrived in the early afternoon and was escorted to the ‘Possum’ cabin along with a complimentary food hamper and champagne. It felt like a dream as we walked along the wooden walkway that ascended into the trees, and the sounds of the rainforest pierced the otherwise peaceful silence. 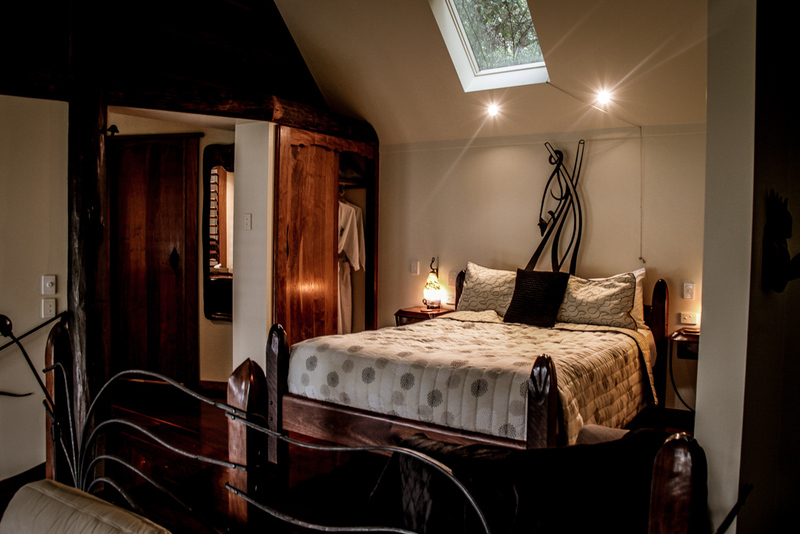 Inside my treetop escape the beautifully carved king-size bed overlooked the kitchen, spa and fireplace, and then out onto the garden and lake. As the sun set over the lake, I ventured out onto my private balcony to enjoy a glass of champagne. There I was joined by a trio of Australian Kookaburras, who looked just as eager as I was to get into the homemade scones. Although I wasn’t in the mood for sharing. Later in the evening I decided to run the spa. I sat, covered in bubbles, indulging in some more champagne. The lake illuminated by the moonlight, and never out of site as I moved about my cabin. I was in complete bliss, sitting on my enormous bed, wrapped in my complimentary robe, completely refreshed from the spa. The world that Secrets’ creates is unlike any other. The following morning, I awoke to the smell of fresh baked croissants at my door step. I had planned to finish my breakfast early so I could explore the town of Montville and the national park, nearby. Montville is a typical Australian country town, consisting of one small main street, full of boutique stores and restaurants serving local produce. And the Kondalilla national park provides a near endless number of things to do for enthusiastic hikers and climbers. Despite my rush to see and explore the amazing surrounds, I found it near impossible to bring myself to leave the cabin. I was enchanted by the dream I seemed to have found myself in and I wasn’t ready for reality. 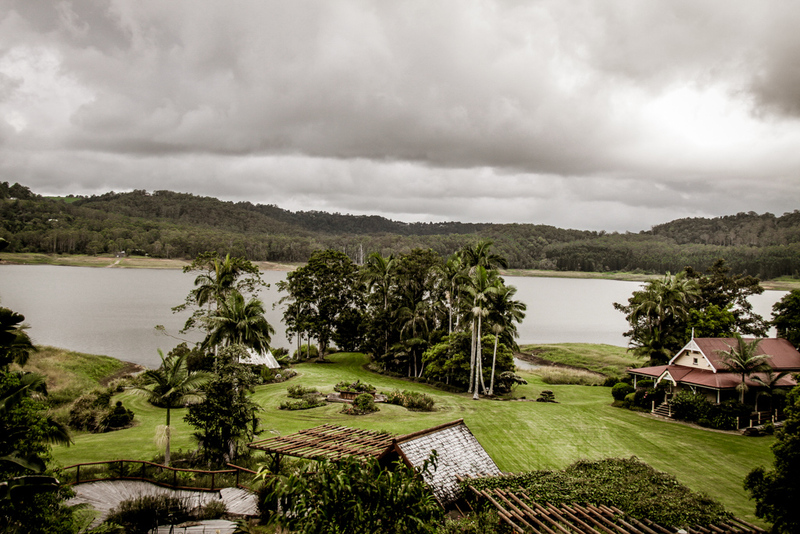 Secrets’ provided an almost surreal experience, a world lost in the rainforests of the sunshine coast.